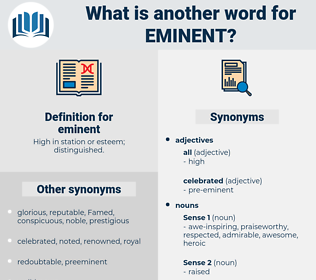 What is another word for eminent? High in station or esteem; distinguished. world-renowned, significant, influential, Famed, high-ranking, important, world-famous, exceptional, foremost, extraordinary, celebrated, noticeable, conspicuous, splendid, honorable, participants, major, well-established, participating, honourable, impending, impressive, landmark. Personalities, Dignitaries, highlights, fellows, Persons. illustrious, remarkable, prestigious, high-profile, brilliant, distinguished, esteemed, reputable, magnificent, great, acclaimed, salient, respected, famous. unnotable, unremarkable, undistinguished, ordinary, insignificant, unimportant, obscure, unknown, inconspicuous, common, disrespected, inferior. deep, depressed, average, Dwarfed, degraded, stunted, low, mean, base, mediocre, short. But his arctic work had been done under such conditions of hardship and at such eminent peril of life as would have deterred most men from ever again accepting such hazardous duty save under imperative orders. See W. Scott's Lives of Eminent Novelists. 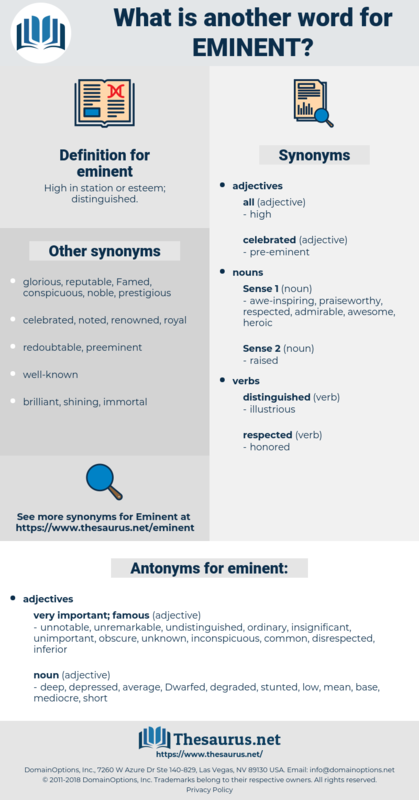 emit, ennead, emote, enmity, emanate, end, ended, endowed, endued with, enate, endow, emydidae, endue, EMDA, emend, emended, emmanthe, emmet, enid.